On March 1st, You’ll Have 24 Hours to Give Where You Live! As a Greenwich resident, you probably know someone at The Nathaniel Witherell. Maybe it’s your elderly parent, a former neighbor or friend. Or, you might have once gotten a haircut from Tony Sciarillo, a Witherell resident who many recognize as “the best barber in Greenwich” in his day. Tony’s shop was a fixture in Chickahominy, and he touched our hearts (and kept us well groomed) during his 50+-year career here. Now, you’ll have an opportunity to support your Greenwich neighbors to “Give Where You Live” during Fairfield County Giving Day on March 1st. This popular one-day, 24-hour fundraising drive will directly impact the quality of life for Nathaniel Witherell’s residents, helping us to provide programs, events, and additional amenities that bring lots of joy. On March 1st, from midnight to 11:59 pm —make your donation by clicking here. The minimum donation is $10 and there is no maximum. 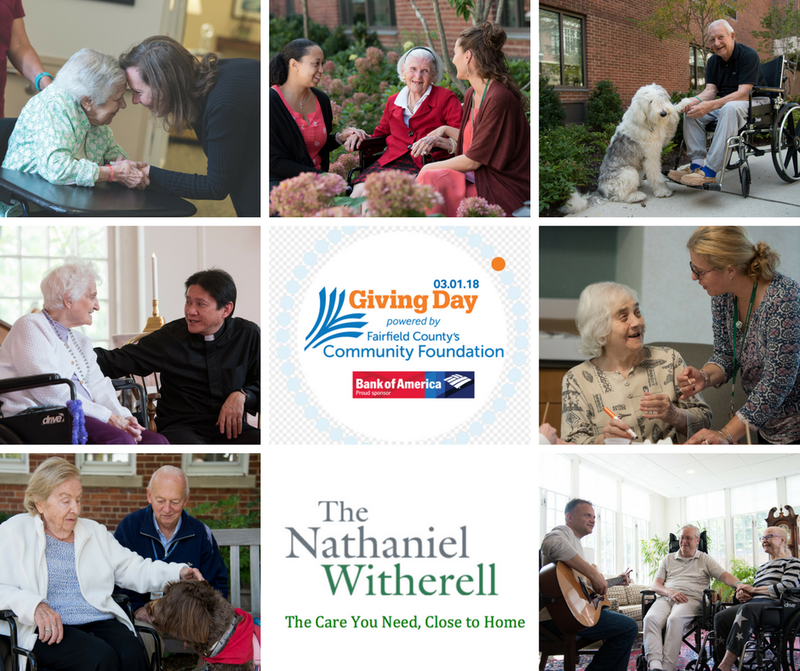 Hosted by Fairfield County’s Community Foundation, and sponsored by Bank of America, Giving Day invites those who love the Nathaniel Witherell to come together and make an incredibly powerful, collective impact. Prize money will be awarded throughout the day to make your charitable donations go even farther. Check benchmarks below and help the Witherell reach them! Spread the word: The non-profit with the most donors could win up to $20,000! Give early: The top 10 non-profits to receive 25 unique donations of $25 or more can win $1,000. Give before 9am!!!! Two non-profits that raise the most dollars by 9am will each receive a $5,000 prize! Click here to give on March 1st! Note: Fairfield County’s Giving Day will take place on March 1, 2018, from midnight to 11:59 PM. All donations must be made at FCGives.org during that 24-hour period. Donations made to individual nonprofit organizations, or through the FCCFoundation.org website will NOT be eligible for Giving Day prizes.